Selects a region of space where two independent fronts run towards each other. The filter can be used to quickly segment anatomical structures (e.g. for level set initialization). The filter uses two instances of FastMarchingUpwindGradientImageFilter to compute the gradients of arrival times of two wavefronts propagating from two sets of seeds. The input of the filter is used as the speed of the two wavefronts. The output is the dot product between the two gradient vector fields. The filter works on the following basic idea. In the regions where the dot product between the two gradient fields is negative, the two fronts propagate in opposite directions. In the regions where the dot product is positive, the two fronts propagate in the same direction. This can be used to extract the region of space between two sets of points. If StopOnTargets is On, then each front will stop as soon as all seeds of the other front have been reached. This can markedly speed up the execution of the filter, since wave propagation does not take place on the complete image. Optionally, a connectivity criterion can be applied to the resulting dot product image. In this case, the only negative region in the output image is the one connected to the seeds. Luca Antiga Ph.D. Biomedical Technologies Laboratory, Bioengineering Department, Mario Negri Institute, Italy. Definition at line 61 of file itkCollidingFrontsImageFilter.h. Definition at line 71 of file itkCollidingFrontsImageFilter.h. Definition at line 102 of file itkCollidingFrontsImageFilter.h. Definition at line 109 of file itkCollidingFrontsImageFilter.h. Definition at line 110 of file itkCollidingFrontsImageFilter.h. Definition at line 92 of file itkCollidingFrontsImageFilter.h. Definition at line 90 of file itkCollidingFrontsImageFilter.h. Definition at line 82 of file itkCollidingFrontsImageFilter.h. Definition at line 94 of file itkCollidingFrontsImageFilter.h. Definition at line 107 of file itkCollidingFrontsImageFilter.h. Definition at line 108 of file itkCollidingFrontsImageFilter.h. Definition at line 106 of file itkCollidingFrontsImageFilter.h. Definition at line 95 of file itkCollidingFrontsImageFilter.h. Definition at line 98 of file itkCollidingFrontsImageFilter.h. Definition at line 93 of file itkCollidingFrontsImageFilter.h. Extract some information from the image types. Dimensionality of the two images is assumed to be the same. Definition at line 81 of file itkCollidingFrontsImageFilter.h. Typedef support of level set method types. Definition at line 105 of file itkCollidingFrontsImageFilter.h. Definition at line 70 of file itkCollidingFrontsImageFilter.h. Definition at line 83 of file itkCollidingFrontsImageFilter.h. Definition at line 68 of file itkCollidingFrontsImageFilter.h. Definition at line 91 of file itkCollidingFrontsImageFilter.h. Definition at line 69 of file itkCollidingFrontsImageFilter.h. Create an object from an instance, potentially deferring to a factory. This method allows you to create an instance of an object that is exactly the same type as the referring object. This is useful in cases where an object has been cast back to a base class. A version of GenerateData() specific for image processing filters. This implementation will split the processing across multiple threads. The buffer is allocated by this method. Then the BeforeThreadedGenerateData() method is called (if provided). Then, a series of threads are spawned each calling DynamicThreadedGenerateData(). After all the threads have completed processing, the AfterThreadedGenerateData() method is called (if provided). If an image processing filter cannot be threaded, the filter should provide an implementation of GenerateData(). That implementation is responsible for allocating the output buffer. If a filter can be threaded, it should NOT provide a GenerateData() method but should provide a DynamicThreadedGenerateData() instead. 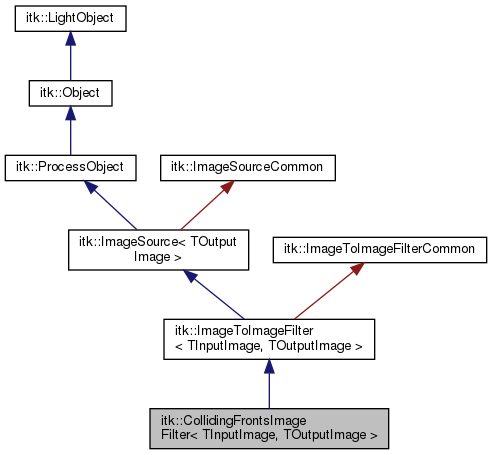 Reimplemented from itk::ImageSource< TOutputImage >. Reimplemented from itk::ImageToImageFilter< TInputImage, TOutputImage >. Get the container of Seed Points representing the first initial front. Definition at line 122 of file itkCollidingFrontsImageFilter.h. Get the container of Seed Points representing the second initial front. Definition at line 135 of file itkCollidingFrontsImageFilter.h. Method for creation through the object factory. Methods invoked by Print() to print information about the object including superclasses. Typically not called by the user (use Print() instead) but used in the hierarchical print process to combine the output of several classes. Set the container of Seed Points representing the first initial front. Seed points are represented as a VectorContainer of LevelSetNodes. Definition at line 114 of file itkCollidingFrontsImageFilter.h. Set the container of Seed Points representing the second initial front. Seed points are represented as a VectorContainer of LevelSetNodes. Definition at line 127 of file itkCollidingFrontsImageFilter.h. Definition at line 87 of file itkCollidingFrontsImageFilter.h. Definition at line 169 of file itkCollidingFrontsImageFilter.h. Definition at line 171 of file itkCollidingFrontsImageFilter.h. Definition at line 165 of file itkCollidingFrontsImageFilter.h. Definition at line 166 of file itkCollidingFrontsImageFilter.h. Definition at line 168 of file itkCollidingFrontsImageFilter.h. Tarballs of the nightly generated Doxygen documentation are available for the html, xml, and tag file.